Everyone put everything aside for a second. Rivalries, competition, money didn't matter. It was just about the health of a fine horse and a legend of a man. Faugheen came into the Leopardstown Festival as one of two horses pipped to take the Christmas Hurdle. 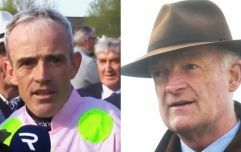 At 3/1, the Willie Mullins trained beauty was an outsider to Apples Jade but only just and the feeling in the pavilion was that the Mullins and Walsh combination could upset the... applecart. At the second last hurdle, however, with Faugheen the only competitor to the leader, the horse and Walsh went down at the 1.50. It was a nasty fall and a dangerous one and one which Walsh did well to tuck himself in and avoid the oncoming field behind them. As it was, Apples Jade coasted to victory with no-one for company but, for a moment, nobody cared about that. Eyes were fixed at the back of the pack and at the second last fence where Walsh and a dazed Faugheen managed to get back to their feet and walk for home.